Fog caused some problems at Auckland this morning with several flights having to divert to other centres, with several QF and NZ flights noted holding at Raglan and Ohura. The first effected flight noted was a Pacific Blue 738 operating PBN7188 CH-AK oveflying Blenheim on way to a hold over Ohura - Can anyone shed any light on the flight number? 7188 isn't a scheduled number so was this flight repositioning due to fog last night in AKL????? Mt Cook ATR NZM70 PM-AK diverted to Hamilton. NZ 744 NZ38 from Hong Kong was also noted making several attempts to land at Auckland. Things probably would've been far worse if the new Cat IIIb ILS system hadn't been in place. Those of you who follow this blog will notice that postings have dropped a little lately. This is partly due to a lack of noteable movements through the Marlborough region, and partly due to my involvement in local theatre. I am the head of the lighting department for Marlborough Repertory Society and Blenheim Musical Theatre, and it's currently show season. I have just finished a run of Shakespeare and am heading straight into a season of Grease followed by the NZ premiere of a new play called Touched. So this is keeping me busy and therefore unable to note absolutely everything that comes and goes through Woodbourne and Omaka. I will continue to post as much as is practical when interesting events are noted. Causing a little bit of an issue with my ACARS early afternoon tracking from Christchurch to Pago Pago was Falcon 900EX N694JP registered to Liberty Mutual of Boston. Logging on my ACARS for the first time today was Air New Zealand Boeing 737-33A ZK-NGP as NZ433 WN-CH. NGP was previously 9H-ADH of Air Malta and was registered to NZ on 17/03/08, and I believe entered service yesterday morning (07-04-08) as NZ500 CH-AK. 04-Apr-08 NZ2292 J32 ZK-ECN reasonible flight from WB-WN turbulent over the coast and Cloudy Bay and on finals for 34 at WN but reasonable flight none the less. 04-Apr-08 Logged at WN were the colourful NZ birds G-THOE and ZK-FRE along with the bulk of the SoundsAir fleet, C208's ZK-SAA & ZK-PDM as well as Airvan ZK-KLC. DJ domestic duty was being undertaken by ZK-PBB and ZK-PBJ. A J32 as well as B1900C ZK-VAE were noted outside the Vincent/Air National Hangers along with Wellington based Citation Mustang N1749L tucked into the corner. The western ramp was busy with Medical movements with Metroliner ZK-LFT, BK117 ZK-HLF, PA-31P-350 ZK-WTH & C221 ZK-MFT all present. 05-Apr-08 a horrible day in the capital with many flights delayed or cancelled, and conditions less than ideal for any spotting or photography. Domestic wasn't fearing much better with delays common on the regional routes. G-THOE spent most of the afternoon parked on Gate 16 before finally departing for AKL around 1730. NZ8132/131 was operated by Q300 ZK-NEZ the most recent example in the fleet. This flight operated from Gate 19 which was great for those of us who spent the afternoon camped at Wishbone with a delicious Double Choc Brownie and a large Coffee! Unfortunately due to the weather and reflections on the windows this was less than ideal for photos. Sitting on the western apron were 2 J32's of Air National one I believe to be ZK-ECP having recently completed a heavy check and repaint into the hybrid Origin/Air National scheme. Also present at Vincent were their two 1900's ZK-VAB and ZK-VAE as well as DHC-8-102 ZK-VAC and the above mentioned Citation Mustang. Flights to and from Blenheim seemed to be getting later and later as the day wore on. NZ2457 was scheduled for 1715 but as the arrival time of NZ2448 got pushed back progressivly futher and futher this seemed unlikely. ZK-EAG finally arrived onto Gate 15 at 1654 24mins late, still some 20mins before scheduled depature of NZ2457 enough time for a turn around but not enough for the scheduled crew rest break, therefore we were pushed back to a 17.40 depature. Boarding commenced at 1730 and then we waited on board until 1745 before the final paperwork arrived at the aircraft. After taxiing full length for runway 16 and waiting for clearance we finally departed at 1759. Wheels were off the deck before the areo club and we were in cloud before the end of the runway. Climb out was at 2000ft/min as we leveled out at our cruising altitude of 6000ft at 1802. We remained at crusing altitude for only 2mins before the long straight in decent into WB. Wheels were back on the deck on runway 24 WB at 1813 giving us a 14min flight time. This is second only to my record flight time of 12mins on a Tasman Pacific Connection J32 flight some years ago. Big props to the crew for the great flight. Nature provided a cruel April fools day joke for commuters today with fog closing Christchurch airport for the early morning, causing cancellations and disruptions nationwide. The only benefit was for spotters with diversions, as aircraft were noted diverting to Wellington, Nelson and Blenheim. 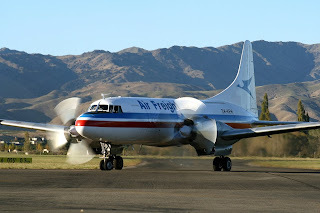 Unfortunately there was only one diversion into Blenheim, Air Freight Convair ZK-KFH operating AFN960 Palmerston North - Christchurch. Causing yet more problems was Eagle 1900D ZK-EAP being noted chocked up during the afternoon with the cancellation of NZ2470 BHE-WLG and subsequent delays for NZ2473 WLG-BHE & NZ2450 BHE-WLG although NZ2473 may also have been cancelled due to the aircraft remaining in Woodbourne.